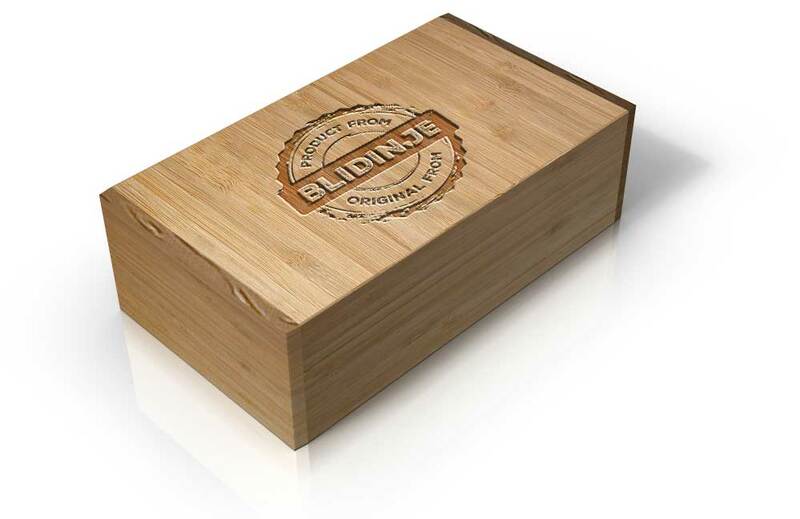 Blidinje Nature Park is an endless source of resources for creating beautiful products. Long-term experience and work of local producers, cherishing tradition and quality, nature, which gives only the best and most valuable products – has resulted in some of the most autochthonous and typical products in the market of Herzegovina, but also the whole region. Every of carefully selected products, the recipes of which have been made by numerous generations of local families since antiquity, brings you a dash of Blidinje, no matter where you are.The particularity and uniqueness of every individual product lies in the fact that diligent hands of our local producers instilled love, tradition and knowledge in every one of them. 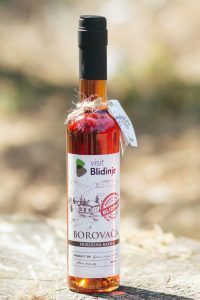 This drink with an interesting and unforgettable taste, typical of Blidinje, is made by processing the fruits of the endemic Bosnian pine at its largest habitat in Europe. In early spring, attentive hands of pickers select the finest pine buds full of curative pollen that are then soaked in home-made grape brandy and a specific sweetener is added. The preparation as such is left in the sun for 40 days in order for pine buds to release their aroma and pollen into the grape brandy. The final product is a cup of health and pleasure on your table. As a natural and tasty choice for your family table, this product brings the freshness of nature in a jar full of taste to your table. 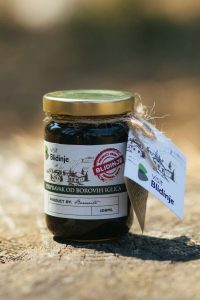 It constitutes a completely new experience, a product made with care and expertise of our producers with the wish to bring the tastes of Blidinje to your table. 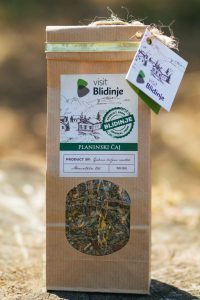 The unique combination of the smell and taste of this tea, carefully made from exquisite medicinal herbs from mountain meadows at a height of more than 1200 metres above sea level, will bring into your home a dash of Blidinje. A cup of pure health will refresh you at any time of the year and energise your body. This syrup stands out as one of the most important herbal products for the treatment of cough and other respiratory tract diseases, gastric distress and compromised immune system. 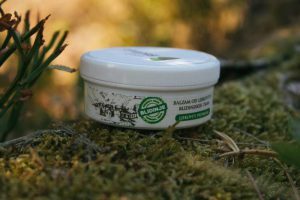 Given its natural healing properties, it is one of the things that everyone should have in their medicine cabinet, and the specific processing of this plant, whose ideal habitat is precisely the mountainous area of Blidinje, renders it even more aromatic and fascinating. As such, it is an extremely efficient and proven remedy for the treatment and alleviation of the above problems. A special balm is made from a mixture of medicinal herbs, collected in pristine nature, high in the mountains. Its healing properties will have a positive impact on your skin and restore its glow and softness naturally. The balm also alleviates pain in the muscle and skeletal system and helps with the healing of wounds, burns, bruises, etc. If you are suffering from bronchitis, asthma, respiratory tract issues or weakened immune system, this product is ideal for you. 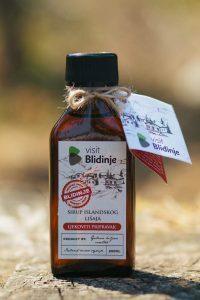 It is made from curative pine needles that are picked only during ten days in a year, a specific period of pine tree pollination, and is one of the most special and most healing products in Blidinje Nature Park. It is a result of long-term and exhaustive work on the formulation and production, and it will have a beneficial effect on your whole body. The abundance of fibres, calcium and iron is what constitutes an extremely high nutritive value of this product, which is well known for its specific, dark colour and strong taste. It makes bread and other pastries distinctive, since it gives them a softer flavour and maintains them longer fresh. What makes this flour special is the fact that every part of its maturation process is linked to various natural weather conditions imposed by the mountain, and its final flavour and aroma are a result of its processing in a traditional stone mill used by our ancestors. One of the oldest and most beautiful examples of synergy between people and animals, between nature and man, is cheese. The local production is based on animal-friendly husbandry, with animals grazing on clean mountain meadows full of medicinal and endemic plants. Since antiquity, mountain shepherds of Blidinje have passed on the tradition of production of a typical mountain product – sack cheese. It is made from sheep or cow milk and ripens in sheep skin sacks, which are excellent for keeping and transporting this easily perishable product. This type of cheese cannot be made industrially, which makes it even more special. This cheese is the best staple of small family agricultural farms.